In the U.S. alone, the Environmental Protection Agency estimates that eliminating food waste would have the same impact on greenhouse gas emissions as taking a quarter of all cars in the U.S. off the road! Does that all seem overwhelming? Yes, no doubt! But the good news is that your actions at home can help prevent this huge strain on our environment, health and general well-being. It’s as simple as doing your best to reduce food waste. On a large scale, food waste happens in almost every sector of the food chain, from the farm to the grocery store, but a shocking 55-60% of all wasted food is lost at the household level. This means the power to do a whole lot of good is in your hands! Take a tip from restaurants and practice “First In, First Out.” How does it work? Put your newly purchased foods in the back of the fridge, freezer or pantry so that the older foods are in front. Once the older foods are in front, you’ll see them first, which can help you remember to consume them before they spoil. Get a permanent marker and some masking tape, and mark every food container with the date you opened it. Before storing leftovers, clearly label what’s in the container and the date you prepared it. This way you’ll know exactly how old something is and where you should put it in your refrigerator or freezer. (see Organize Your Fridge and Pantry above). Your freezer can be an especially useful tool for preventing food waste. Many foods freeze remarkably well (even avocados! ), so it makes sense to put them there if you know you can’t consume them before they go bad. Don’t forget to label and date them, and use freezer-safe containers to prevent freezer burn. People who meal plan make fewer trips to the grocery store, spend less money on food, waste far less food, eat healthier, and enjoy the peace of mind of knowing what’s for dinner after a long, busy day. When you plan your meals, you’re essentially creating a food waste reduction strategy. You buy only the foods you need for the week, all accounted for in the corresponding recipes, and then you eat them according to the plan you’ve created. When you stick to your meal plan, everything gets used up, with little to no waste! As an added bonus, one of the greatest benefits of meal planning is that it can help you be healthier. 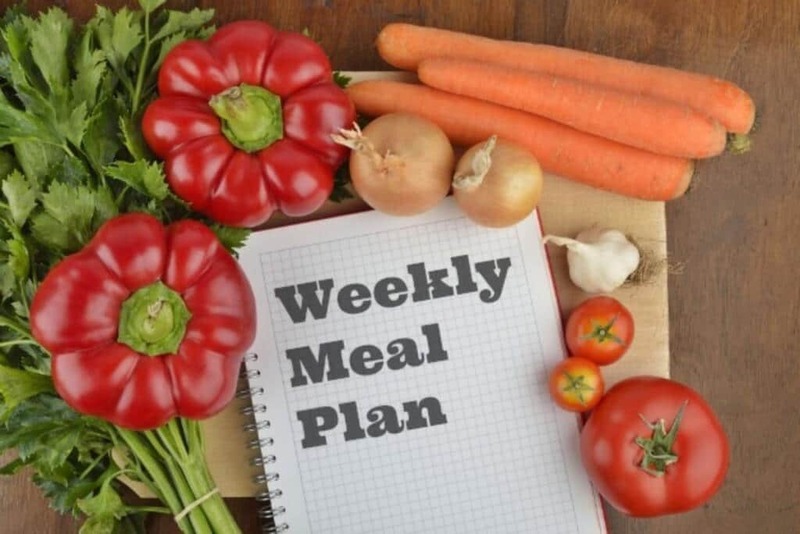 Whether you are trying to lose weight, manage allergies, or control a health condition, a meal plan allows you to easily prepare the right kinds of food to meet your goals. A meal plan can be as simple as writing down exactly what you are going to eat every day for a week, and then buying only those foods that will cover your plan. But if you are like me, maybe you find hand writing a meal plan with the same old dishes every week to be a bit tedious. Or maybe you find creating a shopping list with exactly how much food you need for the whole week to be a bit of a logic puzzle, too. Fortunately, technology has made meal planning easier than ever! RealPlans is the meal planner I use the most because it has some unique features not found on any other meal planners out there. RealPlans is a totally customizable app that allows you to choose recipes from a huge library of over 1500, kitchen-tested Paleo, Primal, Keto, AIP, Traditional, Vegetarian, Whole30, Gluten-Free or Dairy-Free recipes AND you can also import your own favorite recipes into the planner, if you like. You can choose recipes by season, meal, ingredient and more. If you need to adjust serving sizes or modify ingredients to suit your needs, it’s as easy as clicking a button. So if you have friends with food allergies coming for dinner one night, and the kids eating at grandma’s on another night, the app allows you to customize your plan and adjust your recipes to accommodate! Once you’ve selected your recipes, your plan is neatly laid out day by day (with one main cooking day and minimal time in the kitchen). From there, the app generates a detailed shopping list that loads directly into your smartphone to save you time and money. No other meal planning app I’ve found offers all of this in one package. There’s a short learning curve to customize things just the way you like, but RealPlans will revolutionize your kitchen. RealPlans offers a 30-day money back guarantee. 20 Dishes has five different meal plans to choose from: Paleo, Gluten-Free, Paleo Autoimmune, Classic and Vegetarian. You can change your meal plans or mix and match recipes from different meal plans anytime you want. You cannot import your own recipes, however. Once you’ve selected the meal plan of your choice, 20 Dishes then offers you over 200 recipes to choose from. They are continually adding to these recipes on a weekly basis to give you more options and variety. Once you’ve picked your meals, then you’ll automatically be given the appropriate grocery list so you’ll know exactly what you’ll need. All meal plans and shopping lists are fully customizable based on dietary needs, allergens, etc. Once you’ve chosen your meal plan, picked out the meals you want to eat for the week, and gathered all your items from the grocery store, they also give you a clear food preparation plan with videos that show you how to prepare a week’s worth of meals in under an hour. Then, on your meal day, you simply reheat your prepared meals or cook your dishes in under 30 minutes. I love the 20 Dishes meal planning app because it makes batch cooking so simple that, even on really busy days where you might be tempted to eat out, you can easily enjoy a home-cooked meal instead. If you’re new to whole food cooking or batch cooking, the tips, videos and support in this program can really help you out! All 20 Dishes memberships come with free meal planning support and a 7-day free trial. Plan to Eat is an online recipe organizer that takes all of your recipes and puts them into one place where you can plan, cook, and share them anywhere on any device. You can bookmark favorite recipes from the web, build meal plans, create shopping lists, and more. Plan to Eat is my favorite basic meal planning app. It doesn’t come with any recipes, recipe substitutions, batch cooking plans or other bells and whistles; you have to do it all yourself. But it is the least costly of all the meal planning apps out there. You get a 30-day free trial for signing up. Now you’ve got four powerful tools to help you fight food waste, save money and get healthier! Thanks for doing your part to keep your good food out of the landfill, so we can all breathe a little bit easier. These are great ideas and have benefited from most of them, but I especially think organizing the pantry is a big help!!!!! It’s amazing what if in there and needs to be used up. Love all these tips! I implement quite a few of them actually. I meal plan on a regular basis…it is the only way for us. I will admit, I am THE WORST at meal planning! I needed this! Great tips! I’ve been so bad at meal planning lately and I definitely notice the consequences. Thanks for the reminder to get back into it. Really great tips! I love the First In, First Out method. Such a great way to set things up in the fridge. I use to meal plan when my kids were young. Thanks for peeking my interest again! I make a meal plan each week. We’ve literally saved hundreds of dollars each month since we started doing this, and stopped throwing away food going bad. I love meal plans and really think they make a difference for the budget!